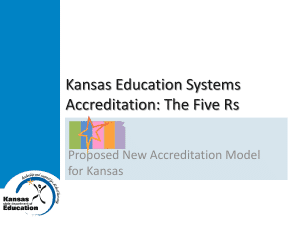 Schools are being asked to spend this school year examining their data, policies, and practices to determine where they “fit” in with new Kansas Education Systems Accreditation (KESA). On the surface, the 5 R’s of the KESA rubric seem pretty straightforward (Relationships, Relevance, Responsive Culture, Rigor, Results) until one starts looking more closely. Do you want help understanding (or getting your staff, BOE, or community to understand) the impact or purpose of KESA or of these 5 R’s? Do you want strategies that will engage staff and deepen understanding of the 5R’s as you apply it to your school? Do you want processes that help you examine the policies and practices of your school and how they impact teaching and learning? Do you want to identify both the data and or practices/policies you already have in place? As part of our mission to promote effective professional learning for Kansas educators and schools, Learning Forward Kansas has developed a Facilitation Guide to support this process. This guide is designed to help educators and schools have a dialogue that increases understanding of KESA and the rubrics. This resource is full of strategies (also known as protocols) to organize and facilitate professional learning discussions with educators and stakeholders that lead to success for all. View and download this FREE resource today! If you have questions or require assistance in implementing the strategies (protocols) found in this document, please contact Learning Forward Kansas. Because of the variety of computers, tablets, and smartphones that are used, we have provided three different viewers for this document. If the first viewer doesn’t work well, try the others. If any pages load incorrectly, refresh the screen in your browser OR use the zoom controls on the PDF viewer toolbar. Several viewing control features are available in the PDF viewer. Hover over or click each of the toolbar icons to see a label or explanation. Download the document using the link provided. Use the addition options, including downloading and printing, that are available with the double arrow icon in the far right of the toolbar.